Shelby Hao-Tamon shows what these marbles look like as eyes. She and her mom, Shelly Hao-Tamon, ran the "keiki corner" yesterday at the Pacific Handcrafters Guild Fall Festival of Art and Fine Crafts at Thomas Square. 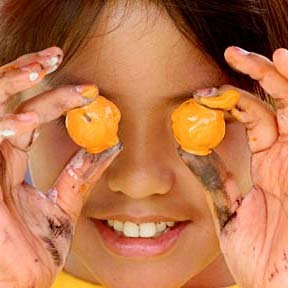 Kids could paint marbles with their own designs. The event continues today from 9 a.m. to 4 p.m.